This entry was posted in art, Autism, Parenting and tagged art, Autism, autistic, awe, emotions, imax, imax Hubble, life, sadness, self-portrait. Bookmark the permalink. What an expressive drawing! And a self-portrait too. She’s really beginning to connect. That one brought tears to my eyes, too. Or maybe she’s always connected, but now is figuring out ways to express it that we can understand.. I just came from a lecture/performance at Juilliard given by Dr. Edward Bilous, the newly-named Director for Juilliard’s new Center for Imaginative Artistry. He compared old models of learning based on linear acquisition of knowledge, to a newer model consisting of a web of entry-points of exploration. Imagining, not archiving. Creating, not consuming. I’m summarizing hurriedly and badly. but I could not stop thinking about Emma. The model of experiencing that she embodies and what we should be learning from her. Ariane, you are opening our eyes. Barli, what a lovely thing to say. Thank you. I’d love to hear more about the lecture. PS. Emma. You too. Opening our eyes. Oh Laura, thank you for writing this. And thank you for getting it. HUGE! HUGE! Wow, what an amazing girl Emma is! I love how she drew her hands. That is how I imagine my son’s own perception of his hands. He is either really sensory avoiding with his hands and clamping them shut, and at times extremely sensory seeking input. I’ve always imagined in my mind that he feels his hands proportionally larger than rest of his body, if that makes sense. It took him forever to point to his elbows and shoulders (when he was younger) b/c his hands overwhelmingly took over. I love how she was able to express her feelings and her desire for help. In third grade, I cheated on my spelling test (first time and last!) and got caught. The teacher asked me to draw a picture of what I did and how I felt. I couldn’t drew the act, but I couldn’t draw the emotion! 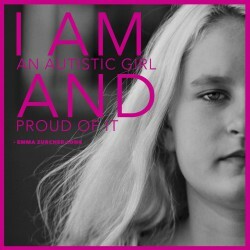 I would say Emma’s self-awareness and expression of her feelings would be amazing for any child! I thought so too. Just fantastic and beautiful. I loved reading your thinking on the hands, I wonder if she feels that way, too.